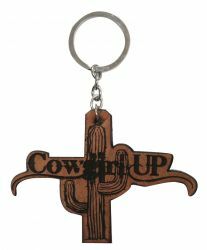 Showman ® Cut-Out leather " Cowgirl Up" keychain. 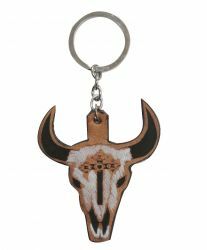 Showman ® Cut-Out leather steer skull keychain. 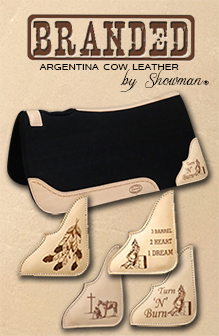 Showman ® Cut-Out leather "3 Barrels, 2 Hearts, 1 Dream" barrel racer keychain. 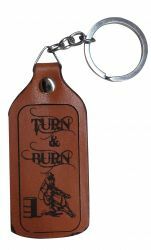 Showman® Leather" Turn N Burn " key chain. 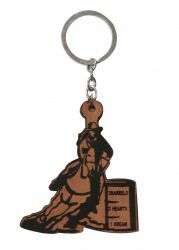 3.25" x 1.5"
Showman® Leather" Riding on Faith " key chain. 3.25" x 1.5"
Showman® Leather " Never Give Up " key chain. 3.25" x 1.5"
Showman® Leather" Kick The Dust Up " key chain. 3.25" x 1.5"
Showman™ black leather key chain with silver peace sign concho accented with crystal rhinestones. Measures aprox 4 1/2". 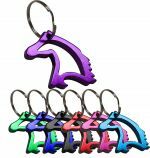 1-1/3" Aluminum horse head key chain and bottle opener. 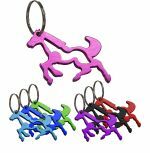 2.5" Aluminum horse key chain and bottle opener. Metal key chain comes in 5 styles. Style E: 3.5" D-ring bit. Style F: 2" Gold spur.